This morning I received a new spreadsheet from Julien Olivier of the Bibliothèque nationale de France with approximately 6,500 coins connected to URIs defined in PELLA and Seleucid Coins Online. 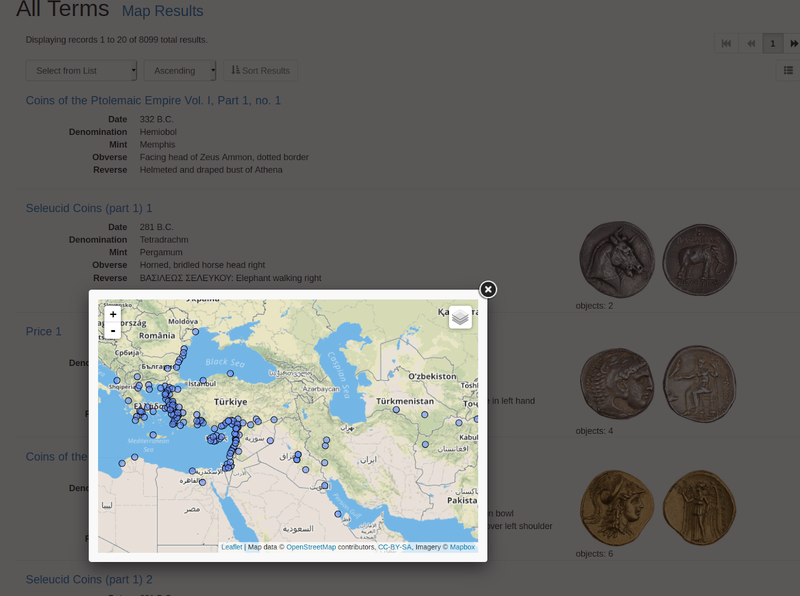 Some 2,000 Alexanders from the BnF have been incorporated in PELLA for quite some time, but we are happy to announce this latest export includes 4,450 coins from the Seleucid Empire. This nearly doubles the number of specimens available in SCO. The ANS has contributed about 4,800 itself. There are now nearly 9,700 physical coins linked to about 2,500 parent types in SCO. Furthermore, all of the coins from the BnF are photographed and high resolution imagery is available through the IIIF protocol. SC 379 (Antiochus I tetradrachm) is one of the best represented specimens. Although I am still working on ironing out some issues with full internationalization of the interface and SVG/image downloads of charts, the new interface has been pushed into the production installation of Numishare, so these new features are now available in OCRE, CRRO, and the Hellenistic Royal Coinages projects. I have yet to create a forwarding mechanism that will parse request parameters for the first iteration of the metrical analysis interface and generate a new series of parameters for the current one. I should have that functioning by the end of the week. Comparing weights of denarii and antoniniani over three centuries. 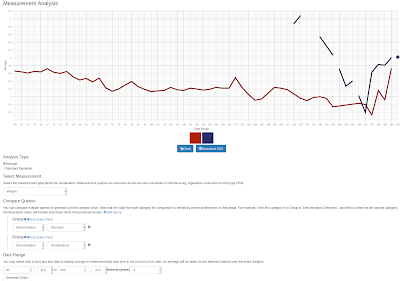 The chart above (linkable here) illustrates the change in average weight of denarii and the introduction and evolution of the antoninianus from 30 B.C. to A.D. 300. The antoninianus, introduced by Caracalla in 215, was intended to be valued as twice that of the silver denarius, but as we can see from the wealth of measurement data we have (42,702 weighed specimens connected to RIC types within this date range [see https://gist.github.com/ewg118/b1989d1604da6c14964217bea96c142b for the SPARQL query]), the average weight of antoniniani minted in 215-220 is 4.88g, which is only 59% heavier than the denarii minted during the same period. So already, the Roman Empire is cutting corners economically by issuing "double" valued currency with lower levels of weight/silver content. Citizens would have been better off hoarding denarii. In the next five-year span, the weight of antoniniani goes up a bit while the denarii go down, resulting in a roughly 1.7:1 ratio, but denarii are still prominent in production, comprising 42% of all denominations minted during this period, compared to about 3% for antoniniani (http://numismatics.org/ocre/visualize?type=percentage&category=denomination_facet&compare=year_num%3A%5B220+TO+225%5D). After 240, by the time we reach the beginning of the Crisis of the Third Century, the average weight of the antoninianus declines precipitously until it hits rock bottom from about 265 to 275, when it barely weighs above (or even below, briefly) the denarius. At this point, production of silver coinage in the Roman Empire transitions almost exclusively to the antoninianus, 64% to 6% for denarius and quinarius (the remaining 30% being bronze or gold [see data here]). Distribution of denominations produced 260-274. 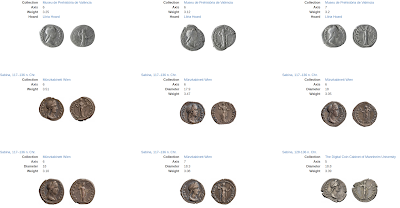 The denominations begin to increase in weight and value beginning in 275 as the Roman Empire begins to emerge from its three decades of internal strife and hyperinflation, though the antoninianus will never come close to recovering its intended 2x value. These, of course, are facts we already knew through intensive study of the Roman economy. But we have a wide variety of typological and metrical data available, enabling us to generate visualizations and downloadable CSV (that can be integrated into other statistical/data science platforms) much faster than ever before. If our data tell us what we already know, then we can be confident that new research questions developed upon these data will yield accurate results. 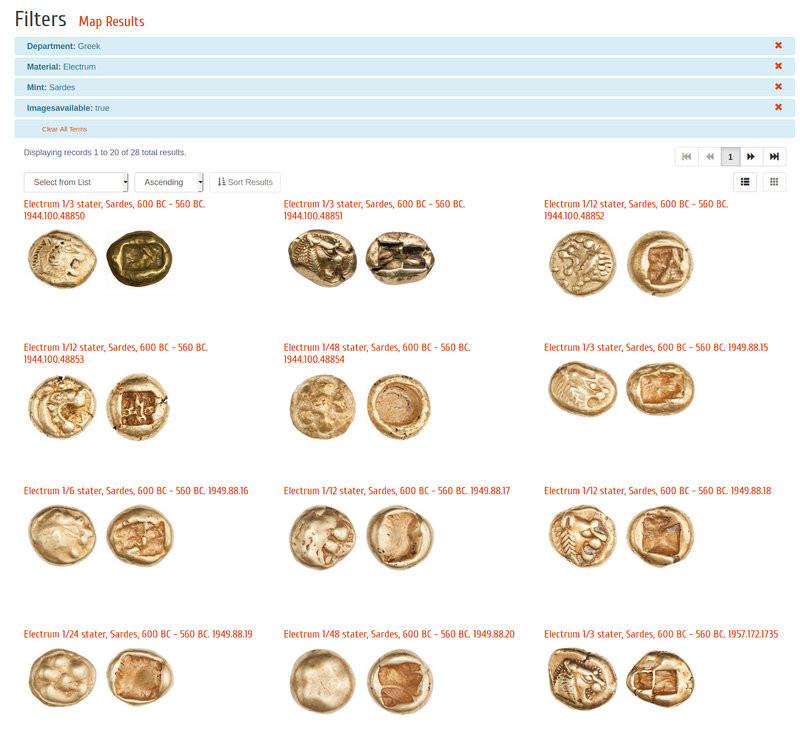 To create an umbrella site that encompasses PELLA, Seleucid Coins Online and Ptolemaic Coins Online for the NEH-funded Hellenistic Royal Coinages project. 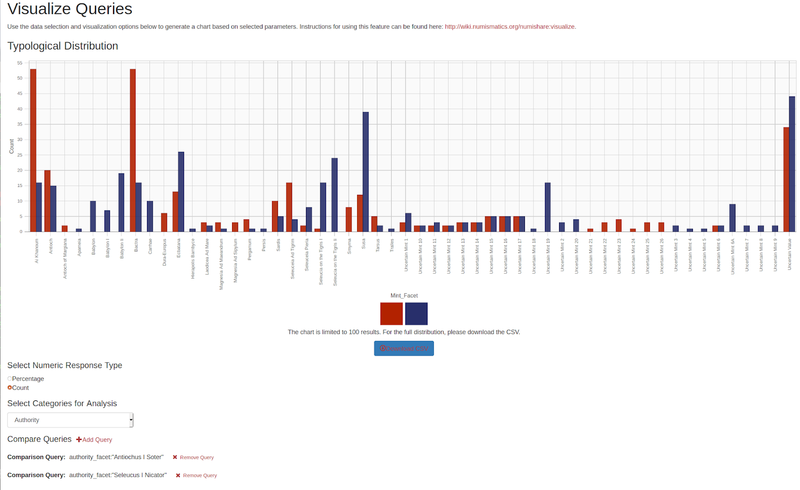 This requires some updating of the Numishare config to include URIs for multiple type corpora to join SPARQL and Solr queries together for the browse interface, geographic visualizations, and quantitative analyses. To make it possible for a digital type corpus to completely stand alone with its own SPARQL endpoint (for Clare Rowan's project on Roman tokens). Although a SPARQL endpoint can be specified in the Numishare config, various parts of the application still relied on Nomisma.org APIs for displaying related specimens in the browse page or average weights and diameters on coin type record pages. This makes it difficult to test the development of a type corpus since types are not ingested into Nomisma.org until they are completed, and specimens are not integrated into Nomisma until they have been assigned permanent URIs. As a result, I have successfully implemented the joining of SPARQL and Solr queries for the HRC umbrella site, which I hope we can launch by May (even though Ptolemaic Coins Online is only partially completed). Map of the full distribution of Seleucid and Ptolemaic coinage, based on current data. 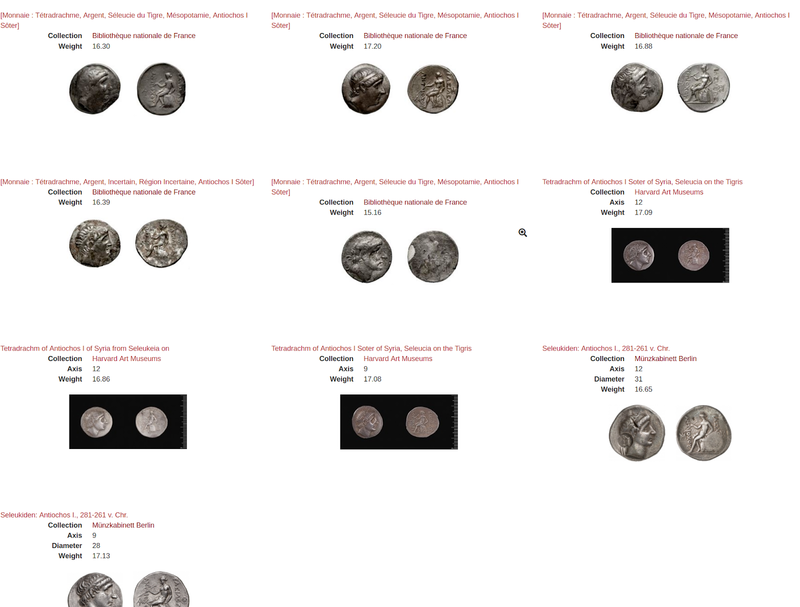 It is now possible to compare the average weight of tetradrachms of Ptolemy I with those of Antiochus I through one interface that enables the query across these disparate datasets. Unlike the Nomisma interfaces, which are exclusively in English, I have adapted those in Numishare to provide the results in each of the languages supported by the framework. If a preferred label exists in Nomisma for a given concept, it will be displayed. If not, it will default to English. 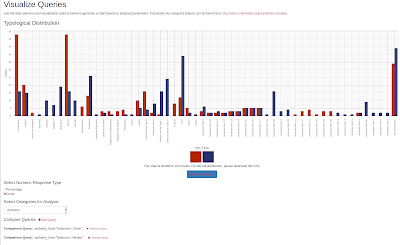 Before these updates, the metrical analyses in Numishare were built on SPARQL, but the distribution visualizations were based on facets indexed into the Solr search index. 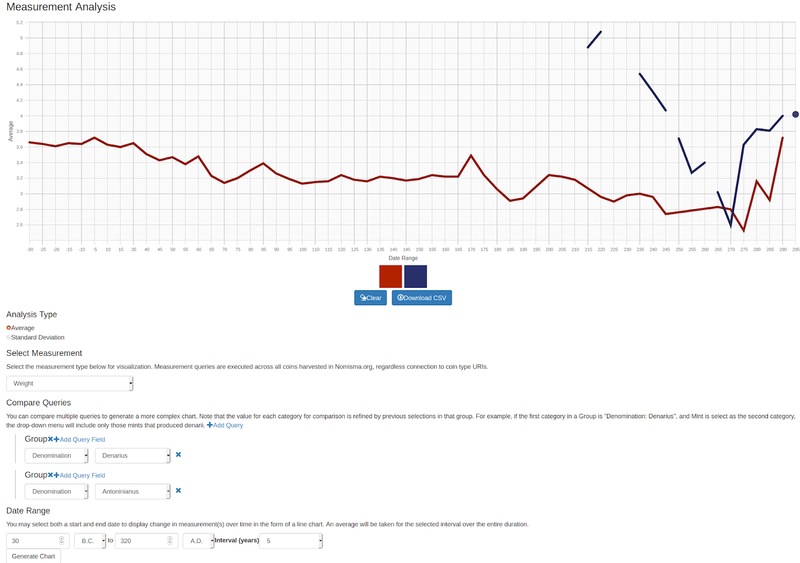 These Solr facet-based distributions applied to both coin type and physical specimen collections. The old /visualize link will continue to exist in Numishare, particularly for specimen collections, but a warning message informs user of type corpora that the Solr-based distributions will be deprecated eventually. The Solr distributions are particularly powerful because the Solr queries might include searches for legends, iconographic descriptions, and fuzzy searches with wildcards. This can be implemented in SPARQL eventually, but the new interface currently only allows queries for typological categories connected to Nomisma-defined concepts (denominations, people, mints, etc. ), as well as start and end dates. The Solr-based distribution analysis interface has also been migrated from Highcharts to d3.js, and an API has been adapted to transform a series of Solr queries (for comparisons) into the d3.js JSON model (with optional CSV downloads, also). I have compared the result of these charts derived from Solr with those derived from SPARQL, and the resulting statistics are identical. They weren't in the initial testing, as the first version of the SPARQL query including all subtypes as well. But any type that has a skos:broader property has been suppressed from the query, enabling a consistent comparison of parent types. 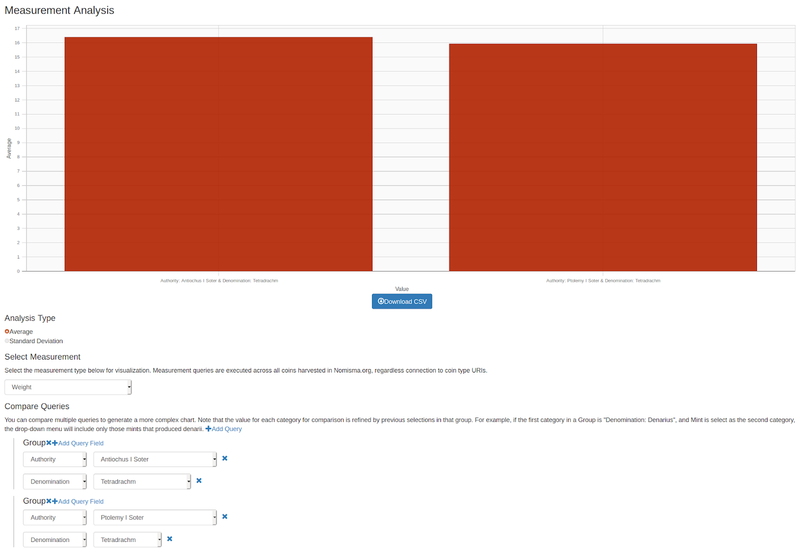 The charts derived from Solr are multilingual only if the language has been enabled in the Numishare config and the types have been reindexed into Solr following the activation of these languages in the interface. Since metrical analyses are being fully migrated to d3.js with a different array of HTTP request parameters, old URLs that point to these charts will be forwarded to the new URL pattern to maintain backwards compatibility. This migration from Highcharts to d3.js is nearly complete, and I hope to move this significant changes to production by the end of April. 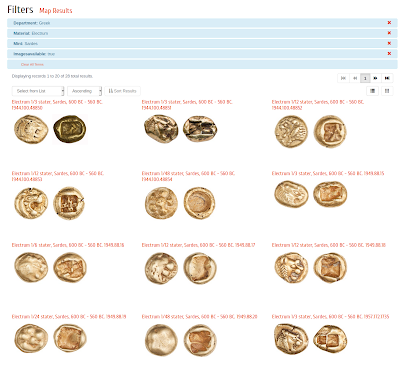 Expect the Hellenistic Royal Coinages umbrella site to be launched sometime between late April and mid-May. 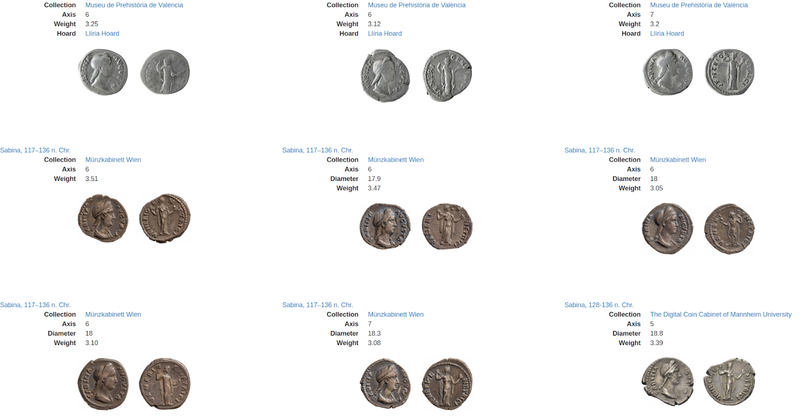 Highcharts remains for data visualization in Coin Hoards of the Roman Republic, but this will be migrated next. 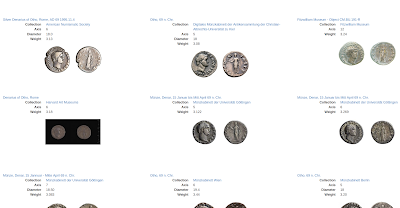 The University of Mannheim digital coin cabinet, part of the NUMiD consortium, has made 29 Roman imperial coins available in OCRE. Mannheim is the 35th contributor to OCRE. Roughly have of all institutions contributing to OCRE are from NUMiD. I have made an update to the Numishare browse page (which affects Mantis, OCRE, and various other projects) to enable changing the layout from the default list view (a row for each coin or type with thumbnails on the right side of the row) to a grid layout that makes it easier to browse visually by making the images more prominent. This layout is similar to the "Examples of This Type" section on coin type pages or the Identify a Coin interface in OCRE. The list view is still the default view for the browse page, but the layout can be toggled by clicking the relevant icons on the row that contains sorting functions (just below pagination). Through the NUMiD consortium of German university numismatic databases (built on the Berlin Münzkabinett technical framework), the University of Kiel is the newest member of Nomisma.or, contributing over 200 Roman Republican and Imperial coins to OCRE and CRRO. Example of RIC Otho 8. There are now 34 contributors to OCRE providing data for more than 122,000 coins. As I reported in early October 2018, we made a huge improvement in Nomisma.org data provenance, connecting concepts to individuals who contributed to those concepts by means of manual editing or curation of spreadsheets uploaded into the system. All of the editors within Nomisma have their own URIs, often connected to ORCID. We implemented two concept schemes to separate the id/ and the editor/ namespace. I have finally made some updates to the HTML serializations of the editor/ namespace page and each editor URI in order to provide greater context about a person's contributions to Nomisma. The editor concept scheme page now contains a list of editors in Nomisma.org. These are the people who have contributed one way or another toward the creation of IDs, even if they are not among the few who have been granted authenticated access to the Nomisma back-end, for example, in the creation of IDs to support publication of type corpora (Gunnar Dumke, Oliver Hoover, Vladimir Stolba, and others). This table is generated by a simple SPARQL query that includes an optional skos:exactMatch that contains an ORCID. I hope to be able to extend the RDF for each editor to include their organization affiliation (seen in Kerameikos at http://kerameikos.org/editor/, which I copied and pasted over from one framework to another yesterday). The chief aim here, which is why we have sought to connect these Nomisma editor URIs with ORCIDs, is to be able to mint DOIs for each person that redirect back to the editor URIs. Nomisma.org data constitute an enormous body of collective intellectual effort, and it's increasingly important that scholarly digital works receive equal weight as traditional publications. Therefore, the creation of DOIs for Nomisma contributions would appear in the scholarly profile in ORCID. Just recently, the AIA issued updated guidelines for the considerations of tenure and promotion, with specific guidelines for the recognition of digital projects, and so our goal of formalizing this recognition within Nomisma keeps us on the cutting edge with respect modern modes of scholarly communication. At present, we are serializing RDF + SPARQL results into DataCite-compliant XML metadata, with the hope that we will be able to piggyback onto a partner institution's DataCite membership (at $2000/year, it is not justifiable for the American Numismatic Society to bear this cost). If this fails, I will rewrite my XSLT for Crossref (which now supports datasets), as the ANS is already a Crossref member, and has minted DOIs for electronic theses and dissertations and some other recent ebooks.